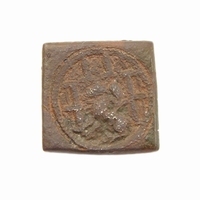 A square double-sided coin weight for weighing a Brabantse Kroon (Zonnekroon of Vlaamse Kroon). 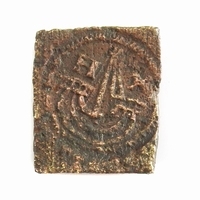 Reverse: Crowned sword dividing the date 16- 48 and initials I.D-.B., hand of Antwerp below. 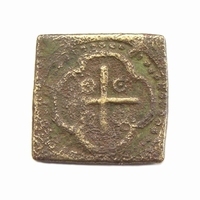 Brabantse Kroon (Zonnekroon, gouden of Vlaamse kroon), issued between 1540-1657 by Charles V, Philips II, Albert & Isabella and Philips IV.